It’s a Tuesday afternoon, and I’m sitting, wine glass in hand and legs propped up in an adjoining chair, on Blenheim Vineyards’ expansive back deck overlooking the heart of Virginia wine country. It’s a gorgeous yet unassuming view. Fields of just-budding grape leaves and spring grasses are interspersed with the occasional rusting tractor, a gentle reminder for Blenheim’s visitors that first and foremost, this is a working farm. A young couple sits next to me enjoying a bottle of Blenheim’s 2009 Painted Red, a signature blend of Merlot, Cab Franc, Cabernet Sauvignon and Petit Verdot grapes alongside a half-eaten bag of GoldfishÃ’ cheese crackers. In the nearby tasting room, a smattering of visitors wearing jeans and flip flops check out the collection of Virginia cheeses offered for sale to pair with their glasses of wine. This place is as unpretentious and relaxed as it gets, which makes this particular farm winery all the more noteworthy, as it just happens to be owned by a certain internationally renowned musician, Dave Matthews of the Dave Matthews Band. Matthews originally acquired historic Blenheim Farm in 1999 for his mother, who in true matronly form informed her son there will be no resting on his laurels, and that the farm should be producing something. 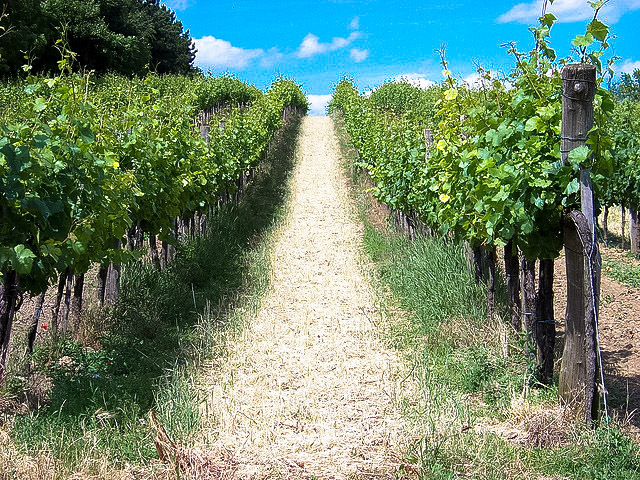 They decided on grapes, and about a year later the first planting was established and Blenheim winery was born. Today, Blenheim maintains 16 acres of grapes which include: Viognier, Chardonnay, Petit Verdot, Cabernet Franc, Syrah and Mourvedre which have been turned into an array of single grape and creative blends at the hands of resident winemaker Kirsty Harmon, one of only a few female winemakers in the state of Virginia. Matthews’ personal commitment to sustainable agricultural practices is evidenced throughout the winery and grounds as well. The tasting room in particular is not to be missed. Designed by Matthews along with master craftsman William Johnson, the building was created to reflect minimal environmental impact. It’s a post and beam style timber frame structure that houses an expansive upstairs tasting room along with a first floor wine production facility. Made exclusively from reclaimed wood, the building has south facing windows and skylights which allows for natural daylight to stream in so the facility can reap the effects of passive solar heating. During the summer months, no electricity is required at all except in the evenings when the sun goes down. The building itself is a sight to behold. Floor to ceiling glass windows lookout over the vineyards, and along with several tasting stations, (located both inside and outside) a glass walkway in the center of the tasting area allows patrons a bird’s-eye view of the barrel room below. For a more up close and personal experience, visitors can arrange for a private tour of the cellar and vineyards hosted by winemaker Harmon, which is offered for both individuals and groups. Wine production also keeps in line with Matthews’ commitment to sustainability and reflects an environmentally mindful approach as the winery actively composts, recycles or reuses all bottles and cardboard items. Even Blenheim’s shipping methods reflect special care for the environment with wines being packaged in fully recyclable boxes and PETE plastic inserts. This sustainable attention to detail is not surprising considering Matthews well-known commitment to organic farming practices (he’s been on the board of Farm Aid since 2001). In 2002, Matthews and his wife Ashley Harper (who is also a Naturopathic Doctor) purchased 1,261 acres not far from Blenheim Vineyards and immediately put the land under a protective land conservation easement so it could never be developed. It was here that the Matthews’ built their certified organic farm from the ground up, “Best of What’s Around”, taken from the Dave Matthews Band song of the same title. The farm actively participates in companion planting, compost teas, worm castings and operates as a CSA specializing in grass-fed beef offering a multitude of cuts ranging from oxtail to hangar steak. The farm also boasts a five acre apple orchard consisting of over 40 different heirloom varieties of fruit. Back at the winery, the day is just starting to wind down. As the sun begins to set behind Virginia’s piedmont hills, I chat with Harmon who has just finished packing up a couple of Rose’s for the last few stragglers, who like me, aren’t really ready to leave. I ask her to describe in her own words what the mission of the winery is when it comes to winemaking and sustainability, “We just want to be as true to the wines and grapes as we can” she tells me. After spending an afternoon at Blenheim, I can see how it really is that simple. A humble winery owned by a rock star. Now there’s a concept. * For more unique wine stories check out our article on wine flour (yes, this exists), an awesome cafe that pairs wine and cupcakes and a poetic guide to Spanish wines. Very interesting. I also heard there is another musician who has a winery in Arizona that is supposed to be pretty interesting but now I can’t remember the name for the life of me. Hi Ayngelina, you may be thinking of Maynard from the band Tool. He has a winery in northern Arizona. Love the idea of a humble sustainable winery being run by a rock star, that would be reason enough for me to visit.